A review of damage from last August's South Napa Earthquake confirms at least one piece of conventional wisdom: seismic retrofitting older buildings is a good idea. The message is driven home in a new report from the U.S. Geological Survey, which shows many of the structures damaged by last summer's quake were built before 1950. The magnitude-6 quake was the Bay Area's worst since 1989, injuring about 200 people. Afterward engineers barred access to 165 buildings with red tags and placed limited-access yellow-tag restrictions on 1,707 others, many of older construction. Geophysicist Jack Boatwright says it should serve as a warning to reinforce such buildings, but he worries that not enough people are listening: "I guess we've got to put on the witch-doctor mask and do the boogaloo," he said. Retrofitting the foundation on an older house might cost a few thousand dollars, and save 100 times that amount whenever the next earthquake hits, Boatwright says. He also found that much of the damage in Napa centered over a sedimentary basin – a kind of geologic jelly bowl that can amplify movement. "It actually traps the energy," he said. 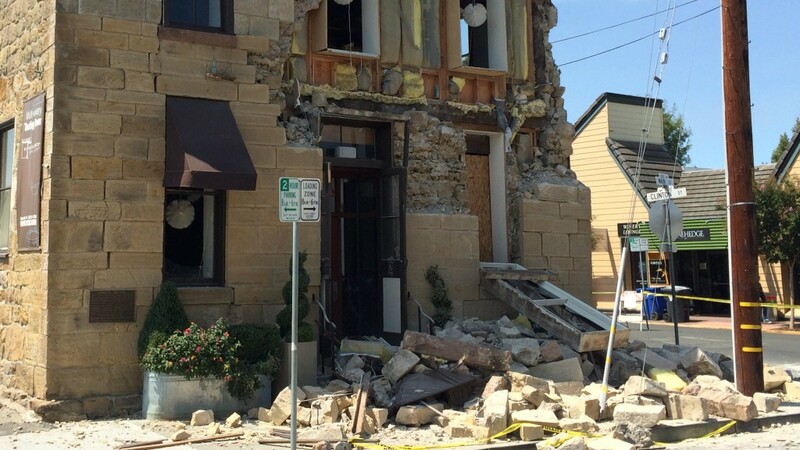 "Somebody in downtown Napa's experience of how long the shaking went on would've been 10, 15, maybe 20 seconds more than somebody who was up on the hill outside of Napa," on hard rock. Boatwright's findings come among six reports on last year's quake published in the March/April issue of Seismological Research Letters, edited by Erol Kalkan, a USGS research structural engineer. Kalkan explained that older structures made of unreinforced brick or stone are built to handle the vertical force of gravity pushing down on them, but the Napa quake subjected them to side-to-side jostling with nearly two-thirds that same force. It's these sideways forces that collapse walls, he said, emphasizing that beams and columns should be fitted with earthquake-resistant connections to a home's foundation. Older chimneys also proved vulnerable, he said. Kalkan says that before last year, the West Napa Fault was recognized but not well understood compared to the larger Hayward and San Andreas faults. Notably, the earthquake last August produced an unusually large surface rupture, which researchers traced for nearly eight miles. As to the matter of when another earthquake might strike, such questions are "really hard to address scientifically," Boatwright says, but he notes that in California, moderate to larger earthquakes "tend to cluster."